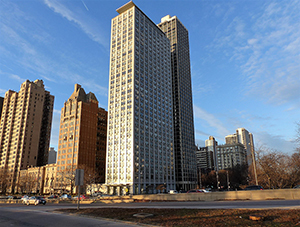 Building Technology Consultants, Inc. (BTC) recently completed work to repair exterior columns and to reconfigure the lobby/first-floor at 1550 North Lake Shore Drive; a high-rise condominium in Chicago’s Gold Coast Neighborhood. For the project, BTC developed rehabilitation options, designed the lobby reconfiguration and exterior repairs, and provided bidding assistance and construction contract administration to the building’s condominium association (the Association). Constructed in 1959, the ground level of the building included exterior columns that had been originally clad in marble panels. 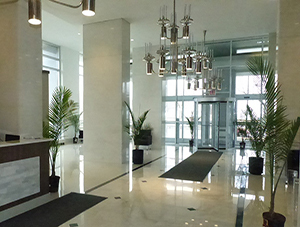 As part of its evaluation, BTC determined that Thermal Hysteresis had caused significant bowing and displacement of large marble cladding panels on the exterior columns, prompting the need for temporary stabilization, and that the building’s lobby storefront system, plaza waterproofing, terrazzo and other site elements also exhibited extensive deterioration. BTC also concluded that the original configuration of the ground level areas had resulted in certain code violations and inefficiencies in the use of the space. Based on BTC’s conceptual design and 3-D renderings of various options, the Association selected an option that included a complete reconfiguration of the ground level consisting of an expansion of the lobby area by moving a new storefront system outward. In addition to addressing the functional deficiencies of the original design and materials, BTC’s design incorporated a larger, more modern lobby floorplan featuring a new reception desk, meeting room, parcel room, mail area, and entrance vestibules. BTC also acted as the lead consultant to coordinate these upgrades with other associated work including upgrades to the HVAC, lighting, plumbing, security, and access systems. While maintaining the original architectural character of the building, these changes vastly improved the functionality and aesthetics of the building’s ground level. BTC’s design also featured new exterior granite cladding, stucco panels, aluminum storefront, stainless steel fencing, automatic sliding glass doors, pigmented concrete walkways, and new drive aisle pavement. Additional details about his project can be found at www.BTC.expert.